Having fun and learning at the same time makes for some productive multitasking. Get your kid interested in learning about holidays from a social studies perspective with these lovely holiday worksheets. Knowing the background of her favorite holidays will make them even more special—and educational! Celebrate a favorite spring holiday with this cuddly Easter egg coloring page. Valentine shapes get your child to practise basic geometry while celebrating Valentine's Day. See what valentine shapes you can find in this worksheet. 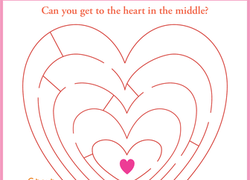 This heart maze gets your child in the spirit for Valentine's Day. Trace your way through this heart maze to get to the centre. Printable Valentine's Day cards make your life a little easier. Make these printable Valentine's Day cards that feature a little love bug. Have fun celebrating Valentine's Day by coloring in the design according to the colour guide! 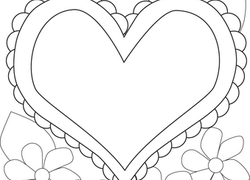 This hearts coloring page features a dizzying group of concentric hearts. Decorate a hearts coloring page with crayons, markers, and glitter on Valentine's Day.